The following items are not provided: Linens (sheets-towels), Pillows, Blankets, Paper products, Toilet products, Special food preparation equipment. There is a $5.00 per day pet fee for our pet friendly rentals. Pet vaccination records are required upon check in. Beautiful tongue and groove walls provide a great Adirondack rustic feeling. Two bedrooms and one full bath. Master bedroom has either a queen or full size bed. Second bedroom has bunk bed with double on the bottom and single on top. Living room has cable TV and a sleeper sofa. Fully equipped kitchen. Porch has Adirondack chairs. Picnic table and fire ring as well. Linens are not included. We recommend that guests bring their own bedding and towels. Tents are not permitted on any of our rental sites. No pets in this rental, please. 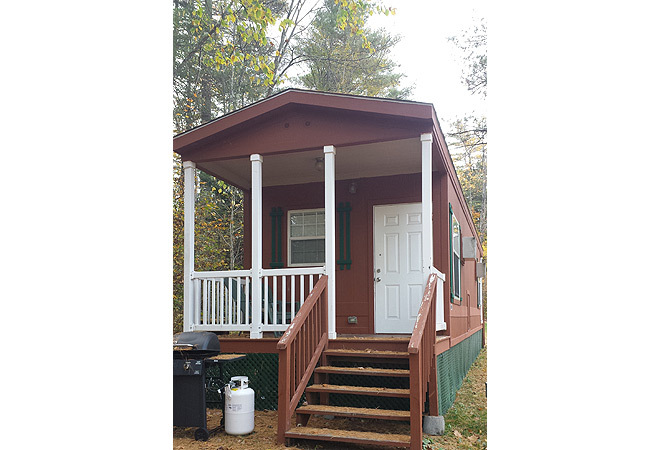 The 40' travel trailers sleep 6 people and include two bedrooms. Each contains a queen bed and a twin bunk bed. In addition, there is a sleeper sofa in living room. Full kitchen and full bathroom included. Outside, the fire pit and nearby picnic table add to the appeal of outdoor living. Linens not provided. Tents are not permitted on any of our rental sites. This studio cottage is cozy and comfortable. The roomy living area holds a TV, double bed and a sleeper sofa. It contains a convenient full bath. In the kitchen is a sink, coffee maker, mini refrigerator and microwave. Outside is a shady porch with Adirondack chairs and a fire pit. This one bedroom/one bath cottage has a loft that the kids will love! Sleeping accommodations include 2 queen mattresses in the loft, a queen bed in the bedroom and a sleeper sofa in the living room. 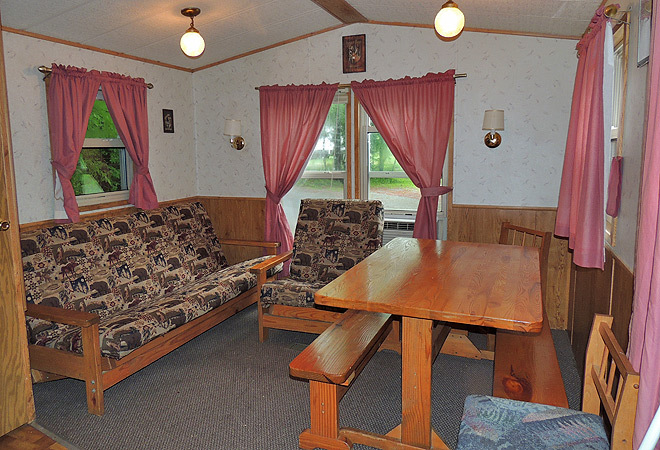 The cottage has a fully equipped kitchen and cable TV. Linens not included. Guests are asked to provide their own linens,and blankets. Outside is a picnic table, fire ring and a covered porch with Adirondack chairs. 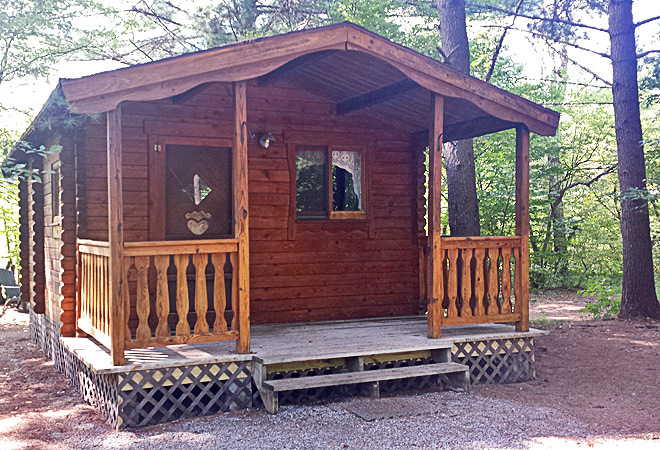 Tents are not allowed to be pitched on this or any rental sites at Lake George Escape. 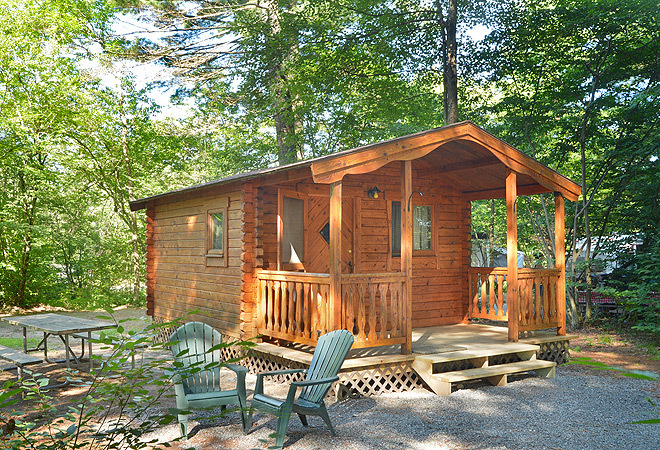 Amidst a verdant forest background, these cozy cabins are comfortable retreats to nature. They come with AC/heat and sleep 5 in a pyramid-style bunk (full on bottom, twin on top) and traditional bunk. 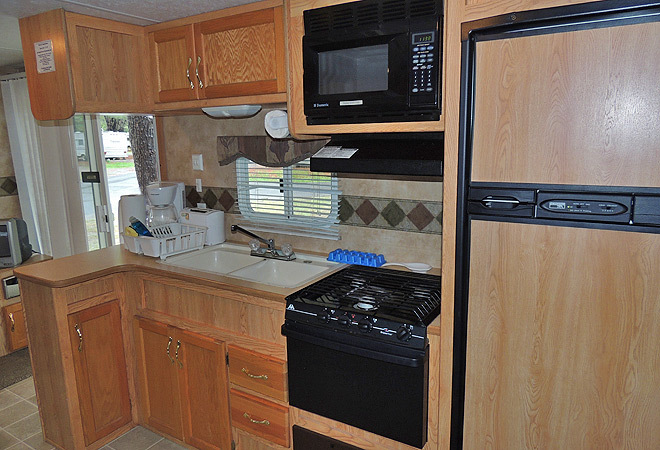 In addition to a 32" TV, a convenient table, pair of stools, small storage cabinet, mini fridge, and microwave complete the living accommodations. Convenient showers and restrooms are situated nearby. Outside, the covered porch, fire pit and nearby picnic table add to the appeal of outdoor living. 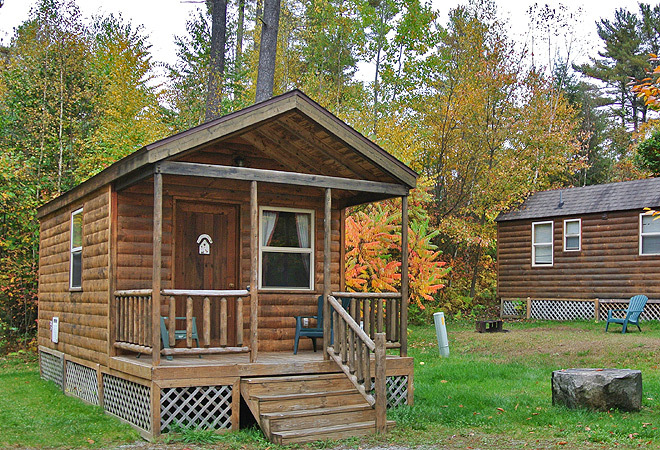 Amidst a verdant forest background, these cozy cabins are comfortable retreats to nature. They come with AC/heat and sleep 6 in a full-sized bed, full-size futon and twin-size bunk. In addition to a 32" TV, a convenient table, pair of stools, mini fridge, and microwave complete the living accommodations. Convenient showers and restrooms are situated nearby. Outside, the covered porch, fire pit and nearby picnic table add to the appeal of outdoor living. The 24' camping cabins sleep 4 people and include one bedroom with full bed, single bed, full futon sofa, small kitchen and small bathroom. Outside, the fire pit and nearby picnic table add to the appeal of outdoor living. 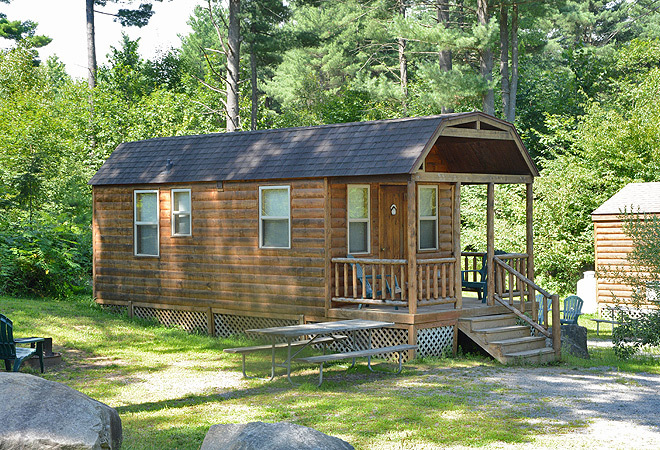 The 28' camping cabins sleep 6 people and include one bedroom with queen bed, crawl-in twin, full futon sofa, loft with queen futon, a fully-equipped small kitchen and small full bathroom. Outside, the fire pit and nearby picnic table add to the appeal of outdoor living. The 34' travel trailers sleep 6 people and include one bedroom with queen bed, twin single bunk, full futon sofa, small fully-equipped kitchen and small full bathroom. Outside, the fire pit and nearby picnic table add to the appeal of outdoor living. Linens not provided. Pets are not allowed in these rentals.